The 19 400-hectare Camdeboo National Park is unique in South Africa encompassing some of the most rugged and spectacular Karoo-mountain landscapes, a large freshwater dam and it almost entirely surrounds the historic town of Graaff-Reinet. The Park is located in the foothills of the Sneeuberge, or Snow Mountains, with an elevation of between 740 and 1480-metres above sea level. The beautifully situated Nqweba Dam, which services the water requirements of Graaff-Reinet, covers approximately 1,000 hectares at capacity within the Park’s boundary. The Camdeboo National Park is probably best known for the spectacular view-site situated above the vast flat plains of the Camdeboo, known as the Valley of Desolation. The jointed dolerite pillars of the Valley of Desolation were formed when the softer sedimentary bedrock eroded away leaving these stark dolerite pillars which frame the southern slopes of the escarpment which rise in jagged profusion to heights of between ninety and one hundred and twenty metres. The view-site overlooking the Valley of Desolation is reached via the Valley Road from the entrance gate on the R63 linking Graaff-Reinet and Murraysburg. The Crag Lizard Walking Trail starts at the Valley of Desolation parking area and extends for about 1.5-kilometres skirting the precipitous mountain edge and provides access to a number of magnificent viewpoints of the rugged valley and across the dolerite spires of rock to the vast plains of the Camdeboo. At the highest point of the trail, marked with a trig-beacon, there are sweeping views across the headwaters of the Nqweba Dam and the rolling hills and mountains of the Sneeuberge. The trail is marked with a Crag Lizard motif. With an estimated 100,000 people who visit this site each year, the Valley of Desolation is the premier tourist attraction in the region. As one ascends the Valley Road towards the Valley of Desolation visitors can alight from their motor vehicles and walk up to the toposcope from where there are spectacular views of Graaff-Reinet, situated far below in the loop of the Sundays River nestled below the Nqweba Dam. To the south-east the 1,315-metre high Spandau Kop stands sentinel over the magnificent landscape of sweeping plains and mountainous terrain. The Camdeboo National Park has a limited network of gravel roads together with a variety of walking trails and 4X4 routes. The Eerstefontein Day Walk starts and ends at the Spandaukop gate on the road linking Graaff-Reinet with Aberdeen, with three route options of five, eleven and fourteen kilometres. Hikers don't like rocks on their heads! The one-hour Gideon Scheepers Trail starts at the Gideon Scheepers Monument, which ends at Barbergat on the R63 to Murraysburg. The Koedoeskloof 4X4 trail in the western section of the park and the Driekoppe 4X4 trail in the eastern section of the park provide opportunities to test your 4X4 driving skills whilst enjoying the peace and tranquillity of this beautiful National Park. Download a map of the Camdeboo National Park. The Camdeboo National Park is home to forty-three mammal species and approximately 250-bird species. The fauna and flora of the Park are well adapted to the arid and fragile Karoo environment with some species such as springbok and gemsbok able to draw sufficient moisture from their food to survive without having to drink. The bat-eared fox, which is mainly active at dawn and dusk, can often be seen hunting with its ears to locate insects below the ground, while the quintessential species of the arid regions of southern Africa, the suricate or meerkat, is always a delight to watch. Plains animals regularly sighted in the park include steenbok, springbok, blesbok. eland and black wildebeest in the open areas whilst kudu, grey duiker and Cape buffalo are usually seen in mixed woodland areas together with red hartebeest and gemsbok. The endemic Cape mountain zebra are less common and prefer the more mountainous and inaccessible areas of the Park together with the klipspringer. The designated game-viewing area of the Park, situated on the plains to the north of the Nqweba Dam, is the best game viewing area within the reserve. Accommodation within the Camdeboo National Park is limited to the Lakeview Tented Camp and the Nqweba Campsite which are accessed via the Lakeview gate on the N9 linking Graaff-Reinet and Middelburg. Nearby Graaff-Reinet offers a wide variety of accommodation and restaurants. The early history of the park includes the use of the area by early, middle and later stone-age people. Evidence of the occupation by these people can be found in the form of stone-age archaeological sites in the south eastern plains of the park. Artefacts found in these sites include bored stones, hand axes, scrapers, blades and grinding stones. Khoisan hunters and herders left evidence of their occupation during the late stone-age in the form of rock paintings in the eastern section of the Park. Trek Boers or nomadic farmers first settled on the Camdeboo Plains and Sneeuberge in the eighteenth century. Over the years the introduction of merino sheep and angora goats together with a variety of exotic plant species resulted in extensive soil erosion and an increase in woody species or unpalatable plants. The Camdeboo National Park was proclaimed as a National Park under the management of South African National Parks on 30 October 2005. The National Park was formed from the nucleus of the Karoo Nature Reserve which was established in 1979 when the International Union for the Conservation of Nature (IUCN) and the World Wildlife Fund (WWF) recognised the urgency for conservation measures in the Karoo biome and listed this action as a world conservation priority. 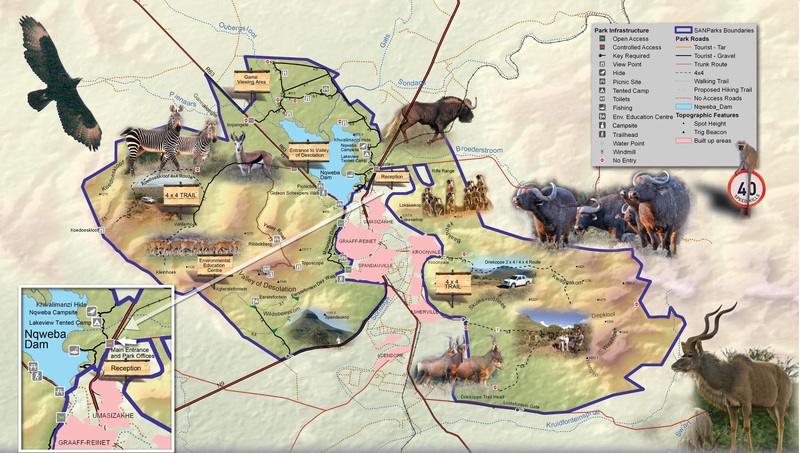 The vision for the future is ultimately to link Camdeboo National Park with Mountain Zebra National Park, protecting a huge diversity of plant and animal species. This will assist in the conservation of the endangered Cape mountain zebra. The objective is to create a single mega-conservation area over 120-kilometres in length which includes up to 520, 000 hectares of land under conservation as a public/private partnership.